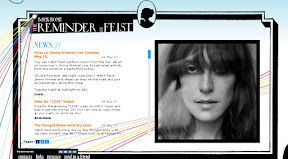 Feist has a new album out entitled - The Reminder - and from what I've heard of it... its sounding strong! Her previous album - Let it die - is an amazing experience. Her voice, lyrics and mastery of the guitar (both electric and acoustic) all contribute to a satisfying CD. An album that is regularly on the iPod and in the car. I had the opportunity to hear her with Phoenix in King Tut's a while back with the Soos... what a night... she had a charisma and presence that transcended her music. I was transfixed on her. She's nuts... but a lovely nuts and very entertaining too. I would strongly recommend that you check her out. I wasn't disappointed. Feist as innn "take it slooow, take it easy on me, shed some light, shed some light on it.."?